The rise of Wi-Fi’s role in home automation has primarily come about due to the networked nature of deployed electronics where electronic devices (TVs and AV receivers, mobile devices, etc.) have started becoming part of the home IP network and due the increasing rate of adoption of mobile computing devices (smartphones, tablets, etc.). 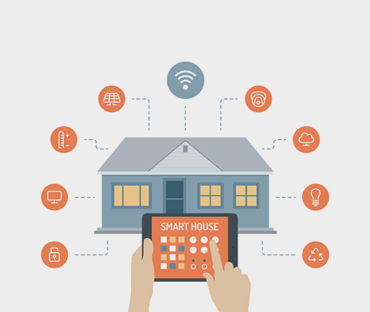 Several organizations are working to equip homes with technology that enables the occupants to use a single device to control all electronic devices and appliances. The solutions focus primarily on environmental monitoring, energy management, assisted living, comfort, and convenience. The solutions are based on open platforms that employ a network of intelligent sensors to provide information about the state of the home. These sensors monitor systems such as energy generation and metering; heating, ventilation, and air conditioning (HVAC); lighting; security; and environmental key performance indicators. The information is processed and made available through a number of access methods such as touch screens, mobile phones, and 3–D browsers . The networking aspects are bringing online streaming services or net- work playback, while becoming a mean to control of the device functionality over the network. At the same time mobile devices ensure that consumers have access to a portable ’controller’ for the electronics connected to the network. Both types of devices can be used as gateways for IoT applications. In this context many companies are considering building platforms that integrate the building automation with entertainment, healthcare monitoring, energy monitoring and wireless sensor monitoring in the home and building environments. 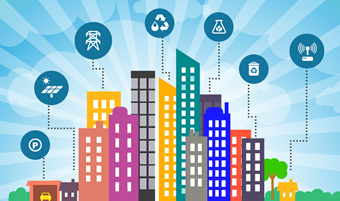 IoT applications using sensors to collect information about operating con- ditions combined with cloud hosted analytics software that analyse disparate data points will help facility managers become far more proactive about managing buildings at peak efficiency. Meeting all of these objectives ultimately adds value to a property through cost savings and enhanced revenue. When contractors can provide these to customers then the IoT technology they offer is delivering a measurable ROI. Do you looking also on IOT for Cars? Not in our scope for now. hey, that’s post is great!. you will see some other posts like this soon. Geographic location, unique IDs, timestamps and more.